Training can be a lonely game. Unless you’re lucky enough to have a training partner, it’s all up to you to motivate yourself, set your goals, and overcome challenges along the way. Whether you’re a veteran marathon runner or a 5k first-timer, issues always crop up. 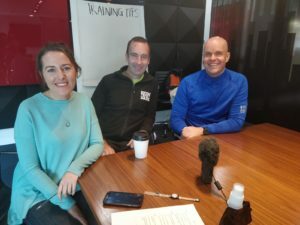 With over 50 endurance events under their belt, John O’Regan and Mark Pollock have amassed lots of tips for training, nutrition, staying motivated, and everything in between. Head of Run in the Dark, Paula Cunniffe sat down with John and Mark to mine them for information and answer your training questions. Here are the 7 tips Paula took from their Facebook live, which you can watch back here. 1. You’ve got to start somewhere! Start slow and build up your training; don’t overdo it or it may put you off. If you can find a training partner, you can help to keep each other motivated and on track with your training. But don’t wait around for someone to join you; get started and you may find that people will want to join in! If you don’t have a goal to keep you motivated, it’s very difficult to stay dedicated to your training plan. So, choose a goal (like running in the dark this November!) and it’ll give you something to aim for. 3. The best time to train? This can be a divisive question – some people swear by training in the morning, and others can’t fathom training until evening time. The answer to the question, “What is the best time to train?” is the time that fits in your schedule. If you’re sitting in traffic on your morning or evening commute, why not get off the bus/train early and run the rest of the way to/from work! John calls this “runmute”! Or, try running for 30 minutes at lunchtime, “runching”! Go hard or go home does not ring true for running. The easy days are as important as the fast days to build up strength, and prevent you from overdoing it and risking injury. If you fall off course on your training plan, go back to your previous session and redo that. That’ll get you back on track, and in a couple of weeks, you may be able to leap frog a session. If you’re running in the morning, you don’t have to eat a big breakfast beforehand, but having liquid in your system is a good idea. And, after running, protein such as chocolate milk is useful for recovery. Apart from that, the best advice is to maintain a healthy, balanced diet. No carb loading here! And, of course, drink plenty of water to stay hydrated.